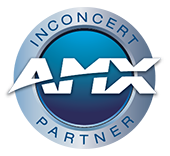 InConcert is a partnership program between AMX and key 3rd-party manufacturers dedicated to saving you, the dealer, time and effort controlling AV components using an AMX system. AMX is continuously evaluating new equipment from every major manufacturer and creating the proper programming modules for these devices to make every installation as quick and easy as possible. Introduced in 2005, AMX Device Discovery is a vital part of the InConcert partnership program. AMX Device Discovery is a technology integrated directly into manufacturers' hardware to make programming easy and operation with an AMX control system effortless. By embedding this AMX-exclusively-designed technology into their products, industry-leading manufacturers are improving the way AV installations are programmed, managed and operated.